The mountains in Bulgaria are generally with a good quality marking, particularly the high parts of the mountains Rila, Pirin and Stara Planina. Tourist marking comes in different types. It is either band-like or pillar-like or represents boards with indications. Beside them, there are other types of marking having different purposes. It is good to know how to recognize them and to avoid undesired errors. The band-like marking is also called summer marking. It represents three lines painted on stones, trees or other objects along the route or next to it. The middle line represents the main orientation color which is surrounded by one white line on both sides. The white color is used to attract the attention so it is called an attraction color. 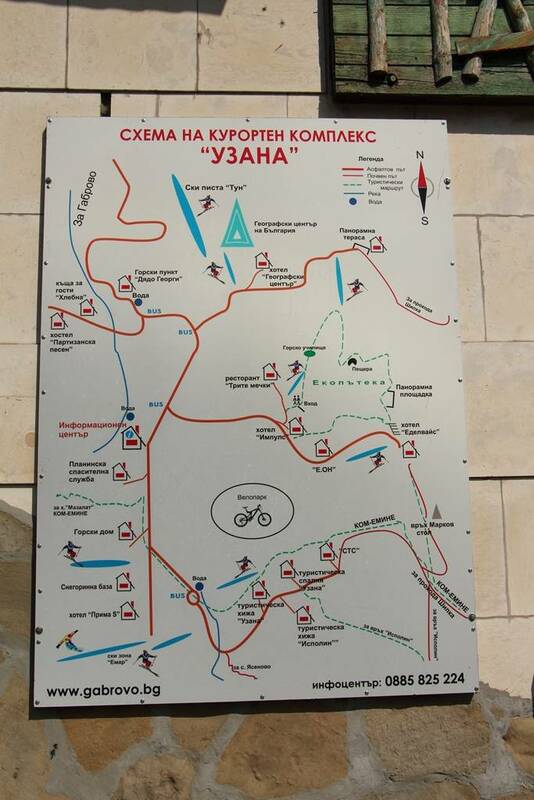 Yellow is rarely used as an attraction color such as in the old marking of the route Kom-Emine.The main orientation colors used in Bulgaria are red, blue, green and yellow. The route Kom-Emine is marked by red blazes. It is very common that several different routes, marked in different colors, meet up and start to run concurrently for a certain distance. In this case the band-like mark is made of three stripes. The outer sides are painted in an attraction color and in the middle there are stripes of the respective orientation color with one attraction color dividing the orientation color stripes.The band-like marking often looks like three lines in the shape of an arrow, like dividing arrows or like a curved line indicating turns of the terrain.Metal signboards are very common on the way and are painted in the colors of the band-like marking. A black stripe surrounded by two white stripes is not a band-like marking. The black color is used for the marking of forest areas as explained further below. Pillar-like marking is represented by poles planted in the ground, on a stone or steel foundation. They are painted in black and yellow stripes, 20 cm wide. They are used for marking winter roads in the mountains. Azimuth boards are often attached to the poles to state the distance and the azimuth deviation to the previous and to next closest pole. The directional signs take the form of arrows and are most often put at offset points of great importance or at spots where one could get lost. It is possible that the signs show a scheme of the itinerary or the itineraries of the region with the hours for trekking indicated on them.A black and yellow chequered sign board is used to indicate possible avalanches ahead on dangerous valleys or paths. 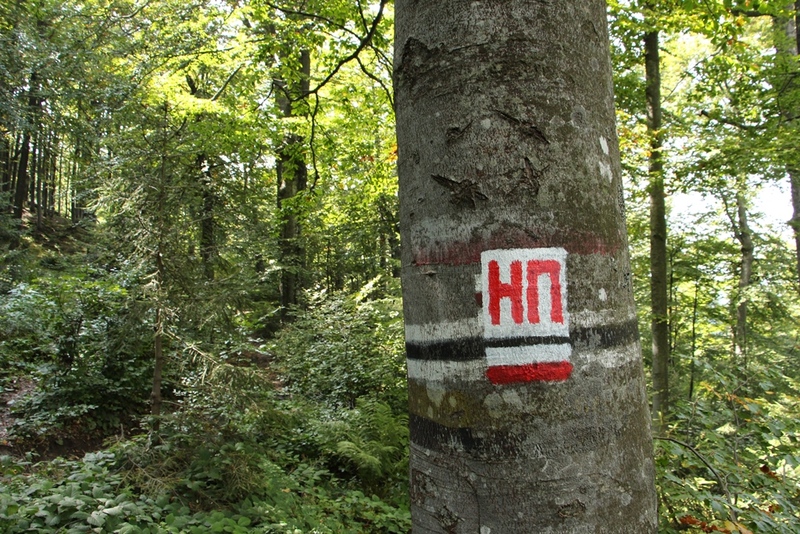 The protected areas in Bulgaria are marked by a band-like marking painted most frequently on trees, stones and buildings. It represents two stripes – a white one and a red one, each of them is 3 cm wide, with an abbreviation on it of the protected zone category. The following abbreviations are used: Р (Reserve), НП (National Park), ПР (Maintained Reserve), ЗМ (Protected Area), ПЗ (Natural Landmark).Usually the red color is placed on the side of the protected area and the white color is placed on the side of the unprotected area. Forestry areas are marked with a white and black stripe, painted at the border of the zone. The number of the respective zone or zones is written on a white square alongside the stripes. It is not correct to use such a marking for orientation, although it sometimes looks like tourist marking. 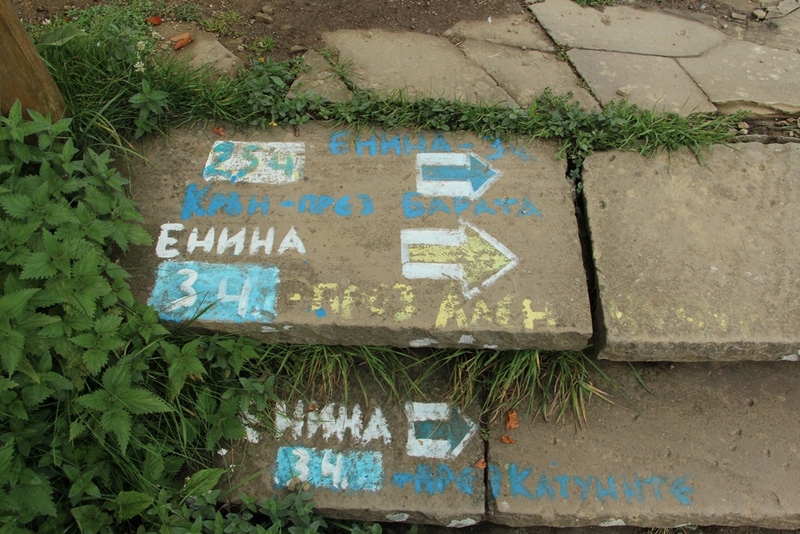 The black color is never used to mark tourist routes.